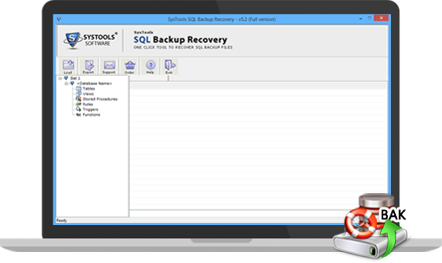 SQL Database Backup Recovery Tool: Convenience Promised! If you are unable to open SQL Server backup file and looking for an effective solution that can recover SQL Server backup database offering ease and reliability, then we confidently present this SQL database Backup Recovery software to you. Intellectually formulated with foolproof recovery algorithms, the software offer users one of the flexible and yes the simplest set up to recover damaged SQL BAK file database. With prominent scanning modes, the software creatively analyzes the actual reason for corruption and acts accordingly to bring out the best and expected recovery results. 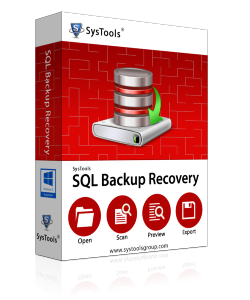 SQL Server Database Backup Recovery Tool allow users to restore complete backup including triggers, stored procedure, tables etc.. The software is capable to recover BAK file of both primary and secondary database (MDF and LDF file) of any size. Tool provides complete preview of all the recovered items like tables, columns, indexes, rules etc. The software provides option to export the recovered data directly into SQL Server or SQL Compatible Script. SQL Recovery Software export recovered data in two ways i.e. with Schema only or with Schema and data. The software allow users to export selected components of BAK file without affecting the Meta data. SQL Recovery Software allow users to restore multiple BAK file quickly without any restriction. The software is compatible with all SQL Server editions and support all the version of Windows operating system. This error message pop up on screen because you are trying to restore the backup created on SQL Server lower version, which cannot be made possible as BAK file of SQL Server cannot be accessed on lower version of the application. Under such situation, when accessibility over SQL backup data becomes impossible, need of an eminent SQL database backup recovery utility arises. You can view live software performance by downloading its free demo version that enables you to execute complete SQL Server backup recovery process but restricts saving of recovered database. NOTE :- If you want to export all recovered objects of BAK file then you must purchase the license version of SQL Backup Recovery Software.